It has certainly been a very picturesque few days around here...hope everyone has been able to enjoy the weather with not too many problems. As you can see from the picture of the trees outside our window we had quite a snowfall overnight and even the normally mundane, suburban street views turned into a fairy tale landscape. I spent this morning doing some shopping and then had an afternoon of gift wrapping...if you are anything like me then you'll relate to the fact that the first batch of gifts look a lot more elegant and fancy than the latter ones! I start on them with all of the shimmery ribbons, bows and curls but before long I have abandoned all the frilly twilly business and am simply wrapping things in paper! Well, I had a fun weekend up in Accrington. I was combining demonstrating with helping to make samples for the craft day hours on QVC on the 27th. Everyone who came along was in festive mood which made for a very enjoyable time on Saturday. That evening was Dawn's Christmas party and here are a few pictures form the evening... Amy (with her lovely cousin Christian) looking elegant except for her frog slippers! The dining room table laid out with cup cakes, chocolate reindeers and gingerbread houses... and here is Jacquie giving her rendition of a craft themed version of Victoria Woods's "I can't do it" which was hilarious and very clever. It was a lovely evening. The following day was much snowier but that didn't stop Joanne and her hubby from coming along as part of her birthday treats. Thank you to everyone who brought cards in for me. Well, we are travelling to my parents' home tomorrow so are hoping that the journey won't be too tricky - think I'll take a flask just in case! So, I shan't be posting again till next year. 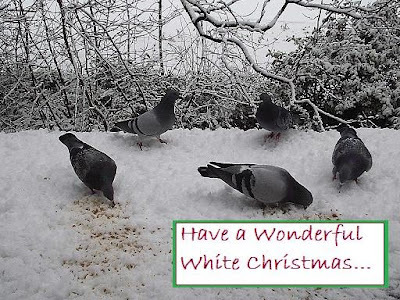 Meanwhile, for those who I had no address to send a "real" card to, here is a little greeting featuring some of our pigeon family enjoying their breakfast today! Hee hee we were laughing about pressies the other day too, same as you first ones are amazing then by the end its a dogs dinner!!! Hope you have a safe journey to your Parents. Happy Christmas to you both. Who's going to feed those birds for the nexr few days!! Lindsay, hope you've had a good Christmas. I'm flying high as kite as I think I was mentioned on QVC just now. Dawn and Anthony were showing Craftwork Cards Card Candy and she mentioned that she'd got a letter from a lady who visited her shop, bought some and now wants all the colours as she's got "card candyitis". I know I put that in my card so I am hoping on hope that the card has arrived - a little late as it was a halloween one so I'm not sure where it's be sat all this time - so I am hoping that by the time you see Dawn again your card should be there. I hope you have a lovely New Year and wish you all the best for 2010.